When the holiday season arrives, you might think about whether you should get something for your boss or the other staff members who work in the office. 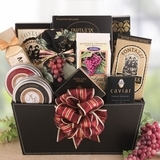 A holiday corporate gift basket is an idea for a small office so that everyone can share the treats inside. You can also get baskets for each person in the office if you know what everyone enjoys. There are some things that you might want to include and some things that you want to avoid giving as a holiday gift, especially to a manager of the company. As you look at baskets for someone who is over you in your job, try to choose something that looks professional. A brown or tan wicker basket with a ribbon is a good starting point. You can get a basket that is already prepared, or you can choose the items that you want to place inside the basket. If your manager likes coffee, then consider various kinds of coffee beans, a mug and cookies for a nice treat in the evening. Bubble bath and lotion are ideal gifts for women. Smoked salmon and a variety of nuts and chocolates are other ideas that you can include in the basket for the holiday.